Hello neighbors ! Is it getting warmer where you are ? Not so much on my side of the fence. It is still soup season and I love it. By the way, one of my staple evening menus in winter on a cold day like today is a salad + a soup + gluten-free crêpes. Stopping by Dolly’s delightful blog, I realized I never took the time to share this recipe for a soup which has become one of the classics in our home. I better hurry: I am not sure that winter squash will be available much longer. I will add red lentils, making it more filling than a regular vegetable soup. Red lentils do not require any prior soaking and basically melt as they cook with the squash. I will also sneak some spinach in – and I hope you won’t mind –, mainly for color. Come inside, make yourselves comfortable and see for yourself how easy to is to make this sweet soup ; supper will be ready in about 45 minutes, unless you speed up things by helping me peel and cut the squash ! 1. Peel and cut squash in big chunks. 2. Put everything (including salt, to taste) except the spinach in a big pot and cook on low-medium heat, covered, for about 25 minutes after the water starts boiling. Both squash and lentils should be tender. 3. Meanwhile, wash and cut spinach in thin strips. 4. Remove chicken carcass if included. 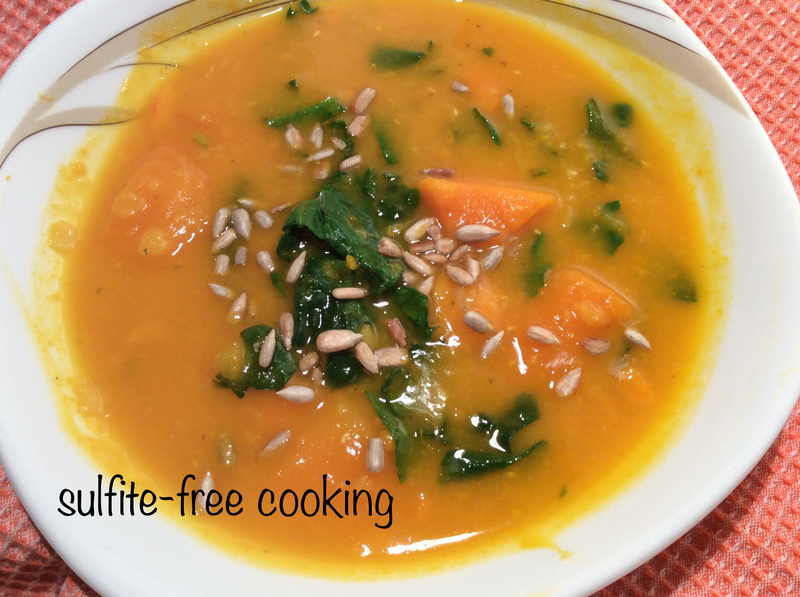 Take out about 500 ml worth (2 cups) of cooked squash and lentils, blend and return to pot. Or you can blend the whole soup if you don’t like to feel any pieces of vegetables in your mouth. 5. Put spinach in the soup and return to heat until leaves have softened. In this photo I included some sunflower seeds for decoration, but honestly they didn’t add any value to the soup. Previous vanilla or lemon French pastry cream (“crème pâtissière”), gluten-free, dairy-free, with the help of a potato masher!! !